In many ways the ultimate trek ! It begins with the flight to Lukla, great mountain views (and heart-stopping approach and landing !). The trek itself will take you through a range of magical landscapes, interesting villages, monasteries at Monjo, Namche, Tengboche and Pangboche, and ultimately to the midst of soaring peaks, with stunning views of Ama Dablam, Kangtega, Nuptse, and Everest itself. It’s a moderately strenuous trip. Day 2 includes the gruelling 600 metre climb out of the valley to reach Namche, day 4 has a similar ascent to Tengboche. Further north there are several shorter ascents, but they are made more strenuous by the effects of altitude. There are also though stretches of far more gentle terrain, and because of the need to acclimatise steadily the daily walking distances are not great. Ultimately you’ll reach 5500 metres – pretty high ! If taken steadily, and allowing the recommended days for acclimatisation, most trekkers will find that they can reach their goal without undue problems. There’s plenty of accommodation, including a number of quite sophisticated lodges. Again obviously the degree of sophistication tends to lessen as you gain height, but even at Gorak Shep twin-bed rooms are the norm. There is also another trail connecting Namche to Tengboche besides the normal Tengboche route 98% of trekkers use. This High Trail follows the west side of the valley and connects the villages of Phortse and Pangboche. It actually offers better views than the standard Tengboche route. 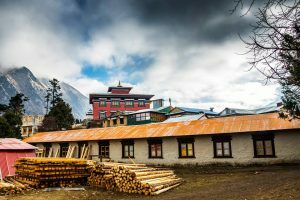 Between Namche and Phortse the trail climbs to the high ridge of Mong La with couple of spectacularly situated lodges. Hiking to or returning from EBC using this variation is highly recommended. Going up and down the same route shows lack of imagination.